Disclosure: This Baked Mozzarella Sticks recipe post was sponsored by Walmart as part of an Influencer Activation for Influence Central and all opinions expressed in my post are my own. Serve these Baked Mozzarella Sticks on a summer snack platter when friends or family stop by. These nutty Baked Mozzarella Sticks can even be made ahead and frozen so you always have some on hand when company stops by unexpectedly. Directions for the Freezer version of this Baked Mozzarella Sticks recipe can be found in the recipe notes below. Let me just say I am so jealous that I can’t enter the Upgrade Your Summer at Walmart Backyard Makeover Giveaway! I need a backyard makeover bad! Eight (8) lucky Grand Prize winners will be able to deck out their backyard in style. Follow the link below to enter. One (1) Palm Springs Wicker Patio Set with four (4) Chairs. One (1) Sonos Outdoor Speakers. One (1) Weber Genesis 11 E310 Grill. One (1) Yeti Tundra 45 Cooler. One (1) $300 Walmart Gift Card (Terms and conditions of the Gift Card apply). Twenty-five (25) Second Prizes: Each winner to receive one (1) $25 Walmart Gift Card (Terms and conditions of the Gift Card apply). Visit the Upgrade Your Summer website to enter the Walmart Backyard Makeover Giveaway. For me, summertime is a time to sit back and relax a little. It’s a time for friends and family to stop by and hang out. I like to keep a few easy snacks on hand for those days when company stops by. This way I can throw together an easy summer snack platter for everyone to snack on while we’re catching up. As usual, when I am stocking up on snack products I like to head out to my neighborhood Walmart where I know I will find the best prices and the largest selection of our favorite snack products. 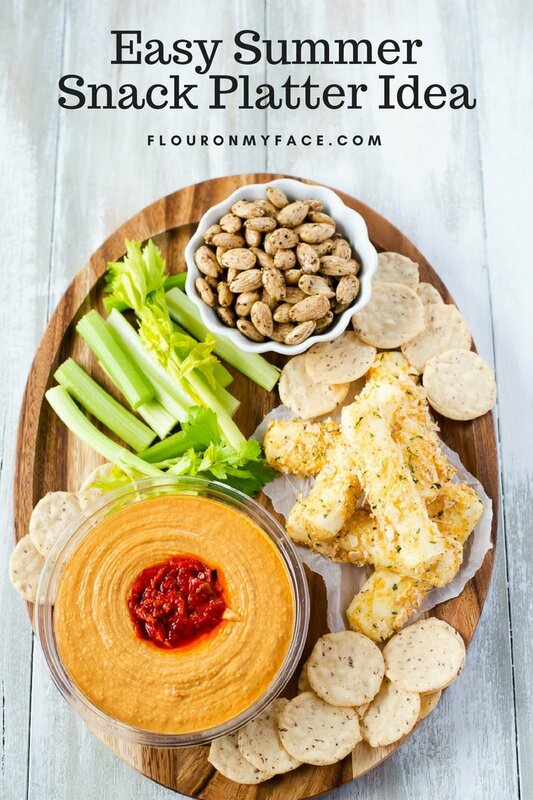 Snack platters are easy to make when you have a few easy to serve snack products on hand. I made these Nutty Baked Mozzarella Sticks and served them on this easy Summer Snack Platter. These homemade Baked Mozzarella Sticks are dipped in a crumb coating made from Blue Diamond Nut-Thins and a few seasonings. 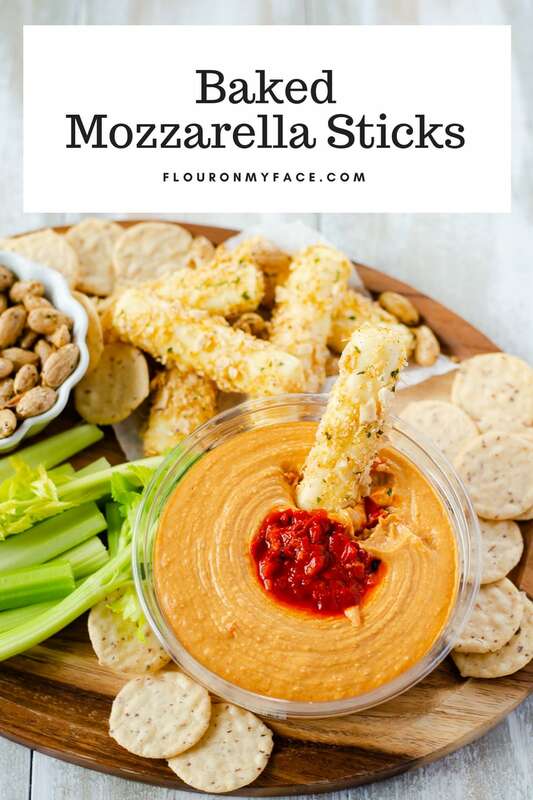 Because the Nut-Thins are wheat and gluten free these Baked Mozzarella Sticks are coated with a wheat and gluten free crumb coating making them a great snack option for guests who are avoiding wheat and gluten. 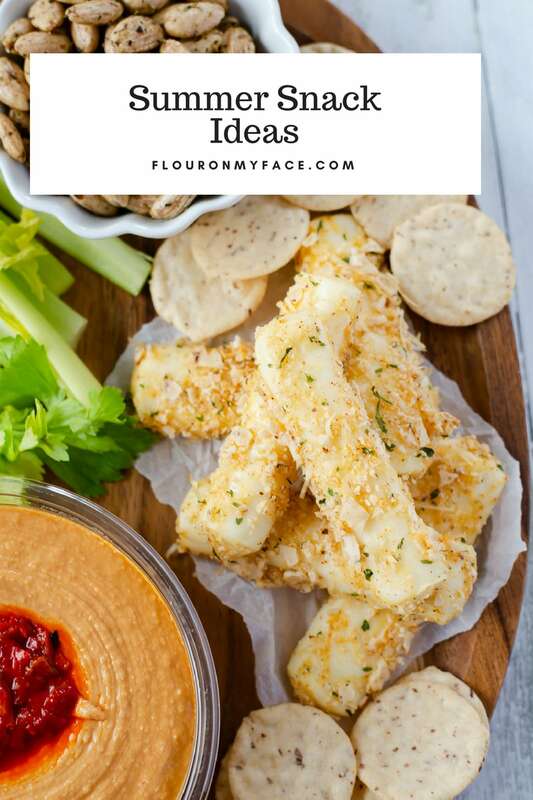 Whether you are looking for a gluten-free snack option or are just looking to serve homemade Baked Mozzarella Sticks as a snack you’ll love the flavor combo from the Nut-Thins and the seasonings I used for the crumb coating. Blue Diamond Nut-Thins is a relatively new snack cracker that is made with Real Blue Diamond® Almonds. The nutty crackers are wheat and gluten free and are made with No Artificial Flavors! They are perfect for dipping. I picked up a box of the crispy and crunchy Almond Nut-Thins Original flavor. These crackers have an amazing nutty flavor and made an awesome coating for my Baked Mozzarella Sticks recipe. They also are perfect for dipping. Blue Diamond Gourmet Almonds are available in some delicious flavors. I picked up a couple of bags of the Gourmet Garlic, Herb, and Olive Oil Almonds. 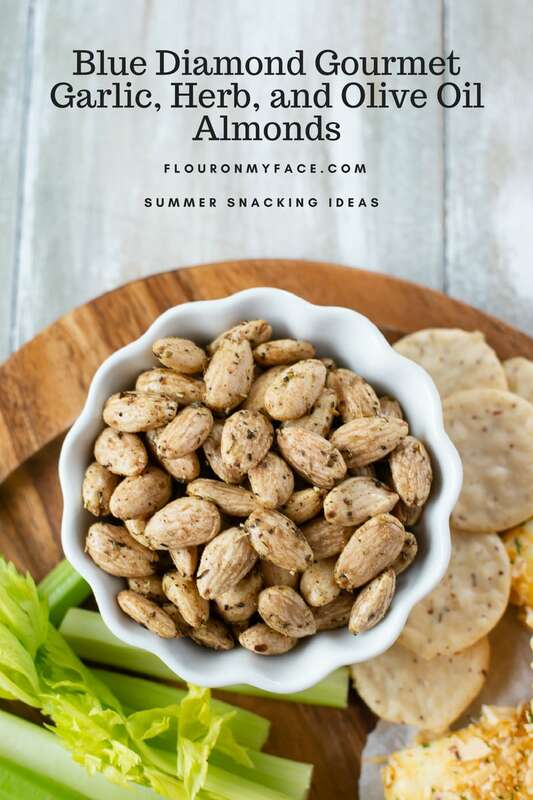 These high-quality Nonpareil almonds are seasoned with chef inspired seasoning that turns a pretty boring snack into a gourmet affair. 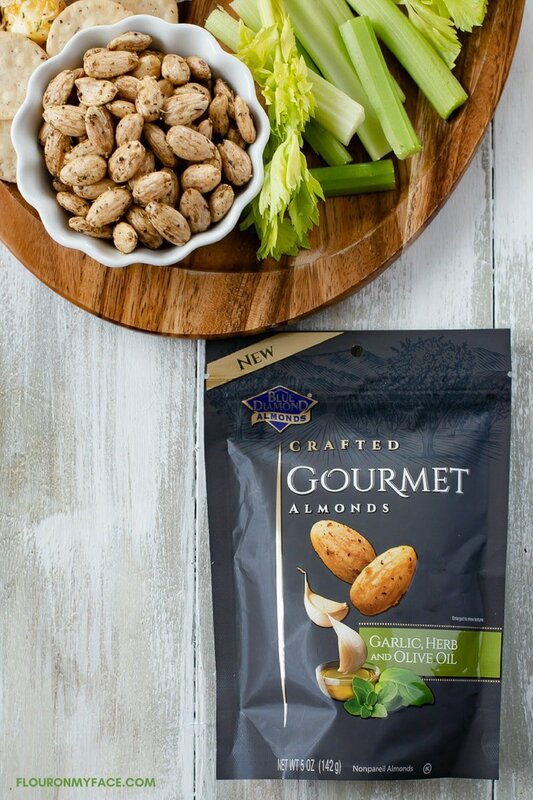 Blue Diamond Gourmet Almonds are a great snack to eat right out of the bag and munch on while watching a movie. Coated with gourmet seasonings that elevate Blue Diamond Almonds to a gourmet level and make them special enough to serve at your next dinner party. Hide the bag and your guest will think you made them yourself. 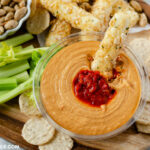 Sabra Roasted Red Pepper Hummus makes the best snack dip. My Baked Mozzarella Sticks dipped into Sabra Roasted Red Pepper Hummus are amazing. 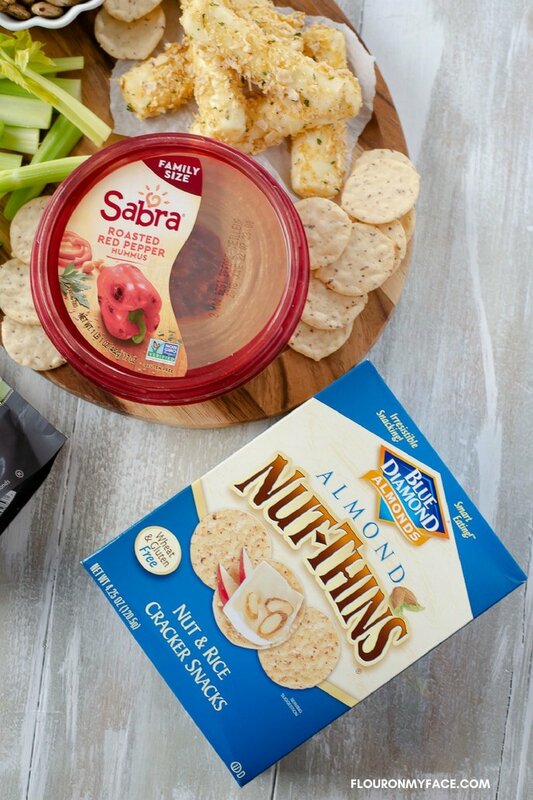 I like to keep Sabra Hummus on hand because it can be served with crackers, chips, vegetables or even spread over a warm tortilla then rolled up and cut into pinwheels to be served on a snack or appetizer platter. Pile on the veggies and serve celery sticks, carrot sticks or even sweet bell pepper rings to dip in Sabra Roasted Red Pepper Hummus. Head to Walmart where you can pick up all the ingredients to make this easy Summer Snack Platter! Preheat the oven to 425 F. and prepare two baking sheets by lining them with parchment paper or aluminum foil. Brush the parchment paper on one of the sheet pans with the 2 teaspoons of olive oil. Set this sheet pan aside to use to bake the mozzarella stick on. The other sheet pan will be used to freeze the mozzarella sticks on. Unwrap the mozzarella cheese sticks and place them in a single layer on the ungreased baking sheet. Place the mozzarella sticks in the freezer for 20 minutes so the mozzarella sticks can firm up. Put the Blue Diamond Nut-Thins crackers in a zip topped bag. Using a rolling pin or the bottom of a heavy glass crush the crackers into fine crumbs. Add the shredded Parmesan cheese, the garlic powder, and the chili powder to the bag. Close the bag and knead to combine the spices with the cracker crumbs. In a small bowl beat the egg with the milk and set aside. Remove the baking tray from the freezer. Immediately dip each mozzarella stick one at a time into the egg and milk mixture. Drop each egg coated cheese stick into the bag with the cracker crumbs and shake well until the mozzarella stick is coated on all sides. Place each crumb-coated mozzarella stick onto the greased baking sheet in a single layer. Repeat until all mozzarella sticks are covered in the seasoned cracker crumbs. Place the baking pan into the preheated oven and bake for 8 to 12 minutes or until the mozzarella sticks are golden brown. Remove the baked mozzarella stick from the oven before they start melting and spreading. 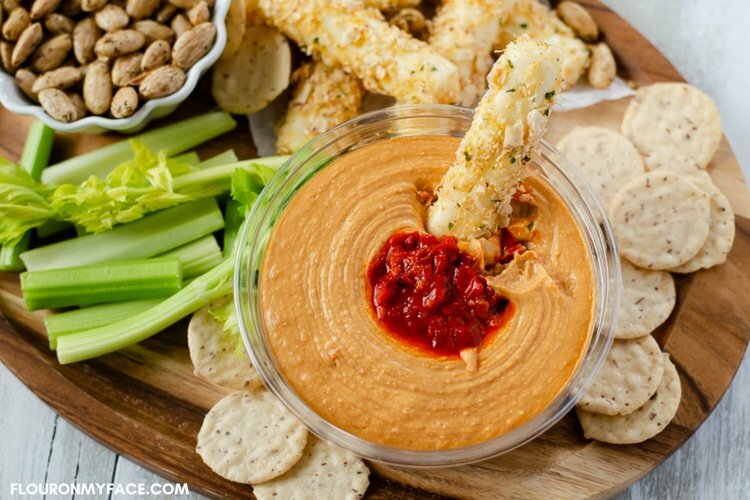 Serve with Sabra Roasted Red Pepper Hummus. Preparing and using two small baking pans to freeze and bake the mozzarella sticks on is easier. If you only have one baking pan remove the frozen mozzarella sticks from the baking pan and place them on a plate before dipping. Remove the damp parchment paper or wet aluminum foil from the baking pan and replace with a fresh piece of parchment paper or aluminum foil. For the directions to make freezer meal cheese sticks see the recipe notes below. Follow steps 2 through 7 to make freezer meal Baked Mozzarella Sticks. Once all the cheese sticks have been coated in crumbs place the baking sheet into the freezer. Freeze the dipped and coated cheese stick for at least an hour. Once frozen solid place the cheese sticks into a freezer bag and store in the freezer until ready to use. To bake the frozen cheese sticks remove from the freezer and thaw 15 minutes and bake following step 8 directions.